I have been traveling a lot recently on British Airways and I have very much enjoyed the flights, and in-flight service, in business class. I have flown several times on their new Dreamliner aircraft, both from Toronto and on-ward to Hyderabad – I find it both comfortable and cozy. They have started to become my international airline of choice. Also, I do really enjoy Heathrow Terminal 5, and the Wagamama restaurant there is an oasis for me to get a warm, flavourful and fresh meal. But, I have been avoiding more and more the British Airways Club World lounges in Terminal 5. Now, in all honestly, the British Airways lounges are typically better than average and get pretty decent reviews most of the time. However, I actually prefer to sit at the Wagamama than in the lounge. I find the lounges in the main terminal extremely busy, crowded, and littered with all the leftovers from the hundreds or travellers that must pass through there daily. It just seems like they can’t clean-up as fast as the people who whirl through there. Other reviews on the web have described it as “congested and untidy”, which I think is a very concise and accurate representation of my many visits there. The food and snack options are limited and I have often struggled with the performance of their WiFi service (likely owning to all the people packed in there using it). I also seem to find that many of the Type A or B power plugs (USA-type) do not work in the lounge area, and I often find myself pulling out my German Type F adapter. If you are travelling from the B or C gates in Terminal 5, I highly recommend making your way to the lounge in the B-gates. This tends to be a lot less busy. A world class lounge… hit by a tornado. The bottom-line: Yeah, it’s good. 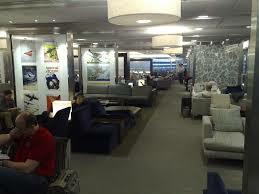 But try and make your way to Terminal B or spend some more effort finding a cozy corner. ← On the Ropes. Yes, the kind you tie stuff with.